Lodged between his delightful slasher Next Victim (1971) and 1972's All the Colors of the Dark (both starring genre favorite Edwige Fenech), director Sergio's Martino's The Tail of the Scorpion is undoubtedly one of his stronger efforts. 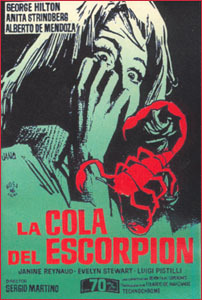 With giallo regulars George Hilton (The Case of the Bloody Iris) and Anita Strindberg (A Lizard in a Woman's Skin) leading the cast, Scorpion's Tail has the attractive power behind it to spur the story onward, each murder leading closer to Scorpion's surprise/shock revelation. Lisa Baumer (Ida Galli) carries on a dalliance with her lover while high above, an airplane soars in the skies. Suddenly and without warning, an explosion detonates within the craft. All aboard are dead...including Lisa's husband Kurt. A phone call awakens the poor widow from her lustful slumber to receive the bad news. No sooner has the news of Kurt's death had time to reach her ears than Lisa receives some additional news. Her husband carried a rather large insurance policy (in the sum of $1,000,000) and Lisa is the beneficiary. She must travel to Athens for the release of the funds. No problem. Once in Athens, Lisa gets the money (in cash) but finds some trouble waiting...seems Kurt had taken a lover of his own, a woman named Lara Florakis (Janine Reynaud) - who wants young widow Baumer to spread some of that insurance dough around. Lisa finds herself in hot water, but with the help of insurance detective Peter Lynch (George Hilton) manages to escape Lara's venom. Beating a hasty retreat, Lisa almost makes it to her flight out to Tokyo...almost. A black-gloved, black-clad killer enters her hotel room, slashes her neck wide open, takes the money and is gone. Photographing Lisa's murder scene is beautiful Cleo Dupont (Anita Strindberg). Together with Peter, the two set out to solve the case. Could Kurt have somehow survived the fiery plane explosion? Or could someone else be out for the insurance payout? The Case of the Scorpion's Tail is one of Martino's best crime thrillers and validates the notion that the director is indeed capable of creating high-intensity nailbiting moments. Even if not entirely sustained throughout. Clearly, Martino's suspense skills (as in the dismemberment sequence in his later Torso) are exceptional and inventive with Scorpion's Tail. A case in point would be the killer's stalking and untimely demise of Lara Florakis. She goes to her lodgings alone. A shadow follows her to the building's entrance. But once safely inside, Lara is horrified to find the 'shadow' on the other side of the door, vigorously testing the bolt lock...and speedily carving a small hole in the window. A climax among the rocky crags and blue-green waters of the Greek isles caps Scorpion's Tail. When Cleo takes an ocean swim, she discovers not only the killer's motivations but simultaneously how close she is to the heart of the danger itself. A memorable, sun-drenched ending. After Tail of the Scorpion, director Martino would carry on with 1972's They're Coming to Get You, a paranoia machine reminiscent of Rosemary's Baby and starring the incomparably lovely Edwige Fenech.